NetEase is a great way to gain exposure to the tremendous growth potential of mobile gaming in China and the Chinese consumer. NEW YORK (TheStreet) -- NetEase (NTES - Get Report) is a great way for investors to gain exposure to the booming Chinese mobile market. This is a Chinese Internet company that operates in three online business segments: online gaming, advertising and email. It runs a popular Chinese Web portal called 163.com. It is also operates Blizzard Entertainment's (ATVI Battle.net service and sells popular Blizzard games such as World of Warcraft in China. On May 14, the company reported first-quarter earnings of $1.55 a share, beating the average analyst estimate by 6 cents. Net revenue was $590.5 million, which was also quite a bit ahead of the consensus and up more than 54% year over year. The stock gained more than 8% on the earnings report. Several days later, Citigroup upgraded the stock to buy from neutral. Citi said it was optimistic about the future of NetEase's mobile games strategy, which pairs Blizzard's successful games with its own in-house developed games and transitions from PC- to mobile-base gaming. The company's popular in-house developed games include Fantasy Westward Journey, Heroes of the Tang Dynasty, Datang, Ghost, Soul of the Fighter and Kung Fu Master. 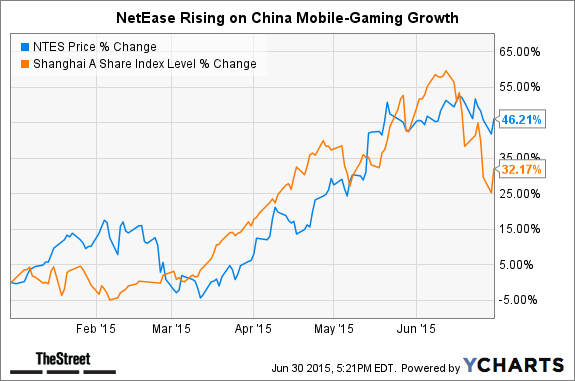 NetEase's successful expansion into mobile gaming in China is the catalyst behind the company's rapid growth. And investors have rewarded the stock with a year-to-date gain of more than 45%, which puts it ahead of China's Shanghai A Share Index (SSEA). NetEase has plans to extend its online gaming presence beyond China, with offices in the U.S. and Korea. It also has a family of Web sites and mobile apps that serve as an interactive marketing platform for advertising. And it's China's largest email service provider and a leading enterprise mailbox service provider. Revenue growth tied to the company's e-commerce platform is also rapidly accelerating. So NetEase has a lot going for it! Its portfolio of self-developed games continues to gain popularity and drive revenue growth. It continues to expand its number of mobile offerings to address China's rapidly growing mobile market. It has paired its strong in-house game development capabilities with Blizzard Entertainment's popular game offerings. And the company's portal and email base make it an attractive site for advertisers. It is great way to play growth in China and the country's growing mobile economy. Now let's take a closer look at the stock. NetEase is a China-based ADR. Its market capitalization is $18.4 billion, which puts it in the mid-cap category. Its risk profile is moderate. 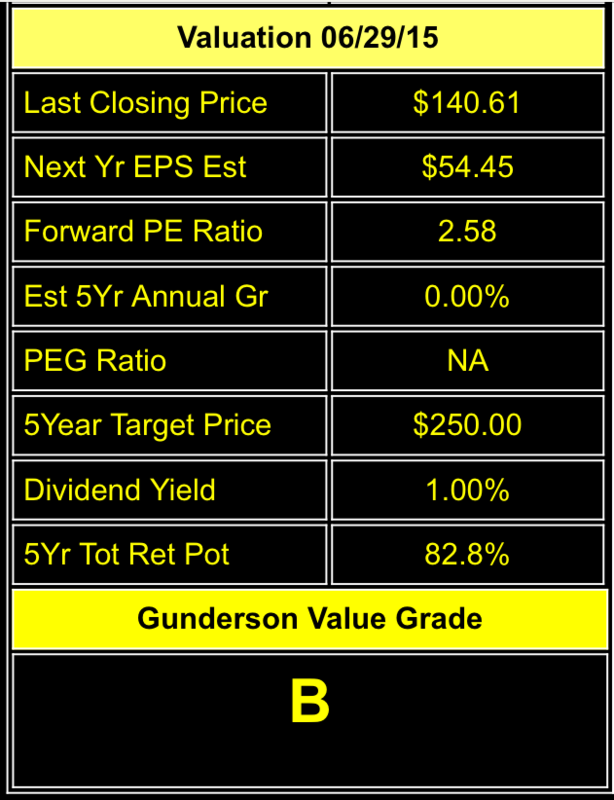 Gunderson Capital Managment is long the stock for its Aggressive Growth accounts. 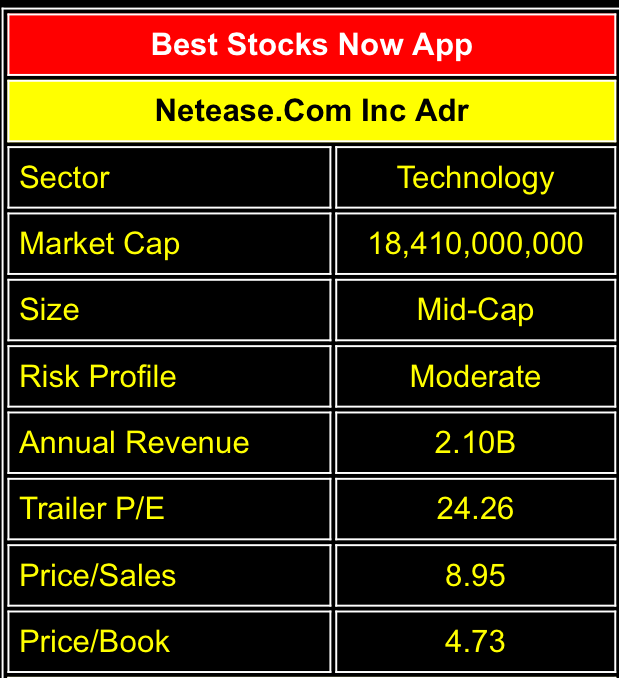 NetEase is a growth stock and does not score as well on a valuation basis. It receives a Value Grade of B given its trailing price-to-earnings ratio of 24. It is also not cheap on a price-to-sales and price-to-book basis. Yet the forward price-to-earnings ratio is only 2.6, and the stock does pay a dividend yield of 1%. That's a nice dividend given the stocks projected growth rate. As mentioned, NetEase has been a stellar performer. 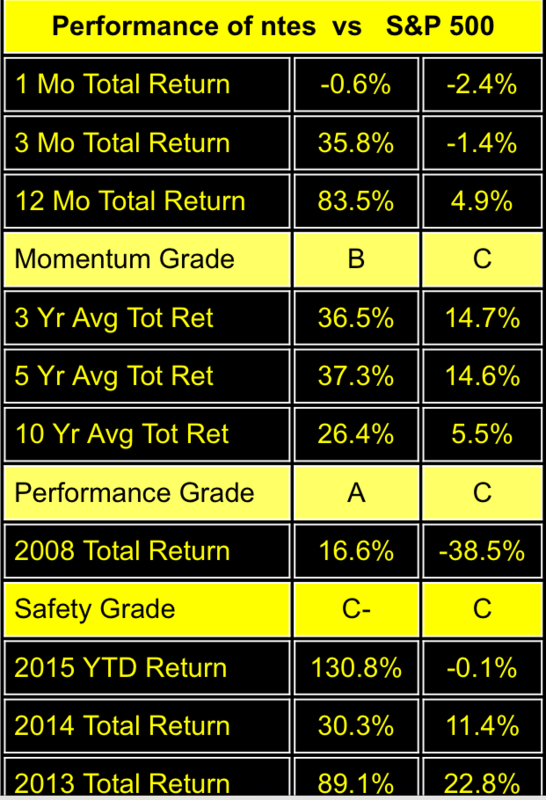 Its 12-month return is 83.5%. It receives a Momentum Grade of B. Its performance over the longer term (over three, five and 10 years) is also strong. The stock receives a Performance Grade of A. 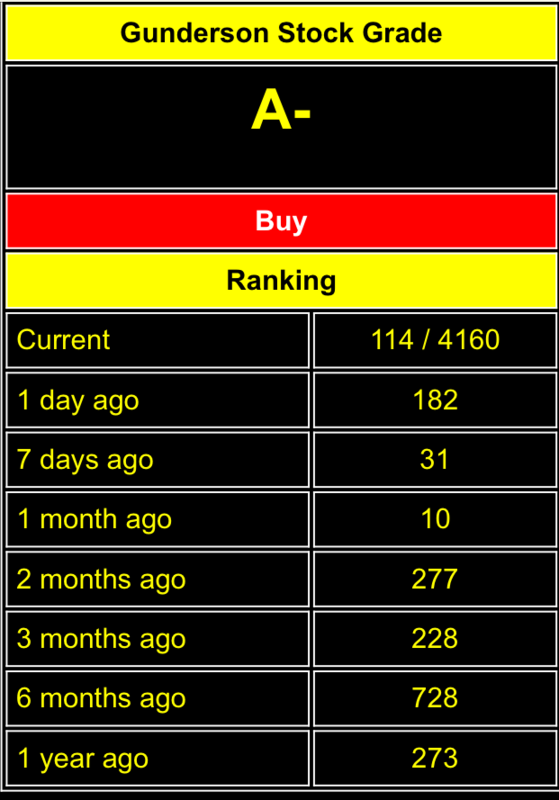 Out of the more than 4,100 stocks in the Best Stocks Now universe, NetEase ranks No. 114. It receives an overall stock grade of A- and is currently rated a buy. NetEase stock is a way to gain exposure to the tremendous growth potential of mobile gaming in China and the Chinese consumer. The company's successful mobile strategy and expansion into email, advertising, and e-commerce make it a great Chinese growth stock to own. This article is commentary by an independent contributor. At the time of publication, the author held shares of NTES.